Blue Angel - Salvia patens - Perennial - Vivid ultramarine blue blooms on strong stems bloom from June to frost. Full sun; height: 26in. Clary Mix - Salvia viridis - Annual - Not true Clary sage, but pretty flower spikes in shades of blue, rose, and white, on tall stems, make this a good cut flower. Jupiter's Distaff - Salvia glutinosa - Perennial - Heart shaped leaves and spikes of yellow blooms with maroon markings. Full sun or partial shade; height: 16in. Lyreleaf Sage - Salvia lyrata - Perennial - Used primarily as a foliage variety, with dark purple leaves and 6in. flower spikes. Full sun or partial shade; height: 15in. Mealy Blue Sage - Salvia larinacea - Annual - Hardy upright annual Texas native. Prefers sandy or gravelly soil in full sun. Tolerates drought and blooms all summer long. Full sun; height: 1-2ft. 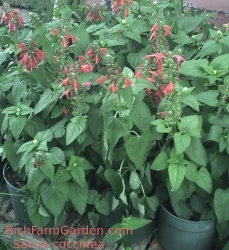 Rose Queen - Salvia superba - Perennial - Rose blooms and medium green leaves. Blooms first year from seed. Full sun or partial shade; height: 24in. New Mexico Sage (Azure sage) Salvia azurea - Perennial; The seeds of this rare variety has been used for centuries as a nutritious grain that can be popped, roasted or cooked with other grains. Tiny azure-blue flowers are borne on spikes. Flowers in late summer. Full sun; plant height: 3-5ft. 80-100 days. White Rain - Salvia superba - Perennial - Upright uniform growth with white blooms and green leaves. Long blooming. Great Moon Garden plant. Full sun or partial shade; height: 24in.